It was our last hurrah in Maine; Brian and I were excited to do a buddy boat cruise in Penobscot Bay with our local friends, Dennis and Candace (s/v Solstice). Our friends were excited too, they’d taken off Friday to make a long weekend of it. After a quick trip to the grocery store for the bare essentials (beer, tonic, bacon and tortilla chips) we loaded up the boats and got underway. We were so efficient that morning that we departed before noon. True to our experience in Maine, there just isn’t any wind before noon. So getting started took a bit of patience as we bobbed our way past the Owl’s Head Lighthouse and into Penobscot Bay. Dennis made certain that we did not have an itinerary but just go where the wind would take us. Having been a schooner captain for several years, Dennis also knew all of the wind’s hiding places, shortcuts, and less traveled thorofares. I’ll confess both boats fired up the engine to make tracks across the bay. But mid-way across, right on cue at about 12:30pm, a nice northwest breeze came through. Rode Trip followed Solstice heading south along Vinalhaven. 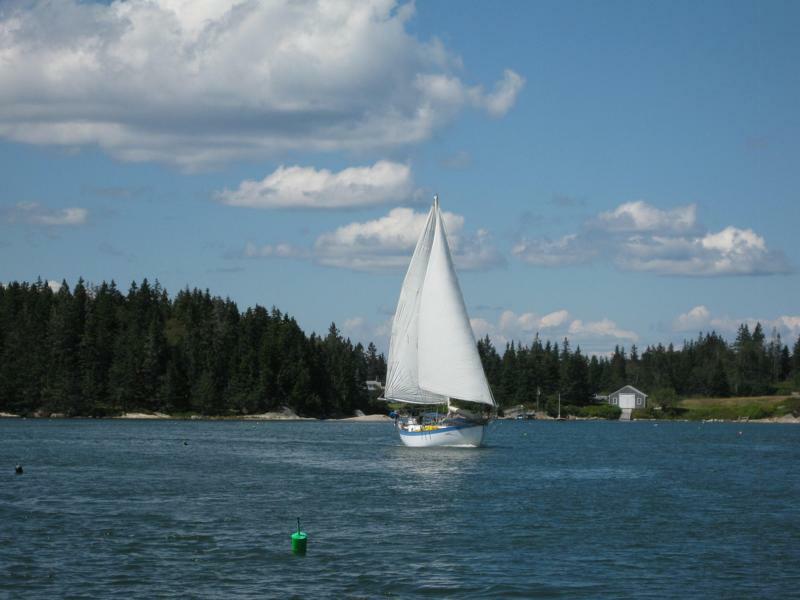 We breezed right past the entrance to the Fox Island Thorofare and sailed down through the Leadbetter Narrows. 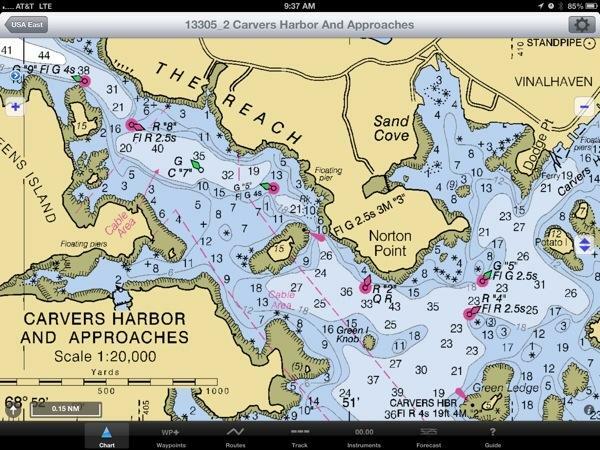 Our route is best viewed on the track, but here is also a zoomed screen shot of our chart. The Fox Island Thorofare entrance is marked by a green/red can (GRC) at the top left corner. 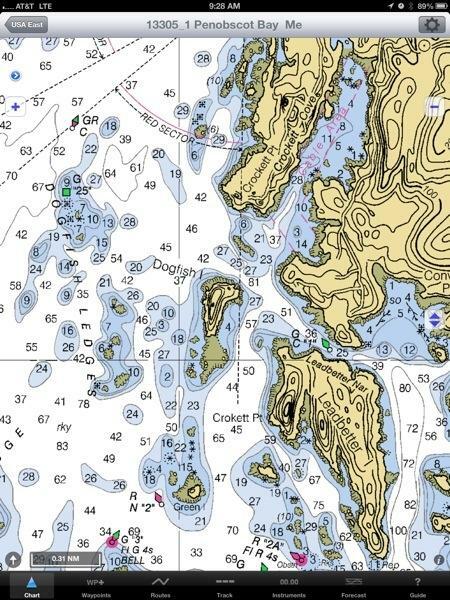 You can see in the bottom right Leadbetter Island and a tiny, narrow passage marked by one green can (GC “1”) between Leadbetter and Vinalhaven. 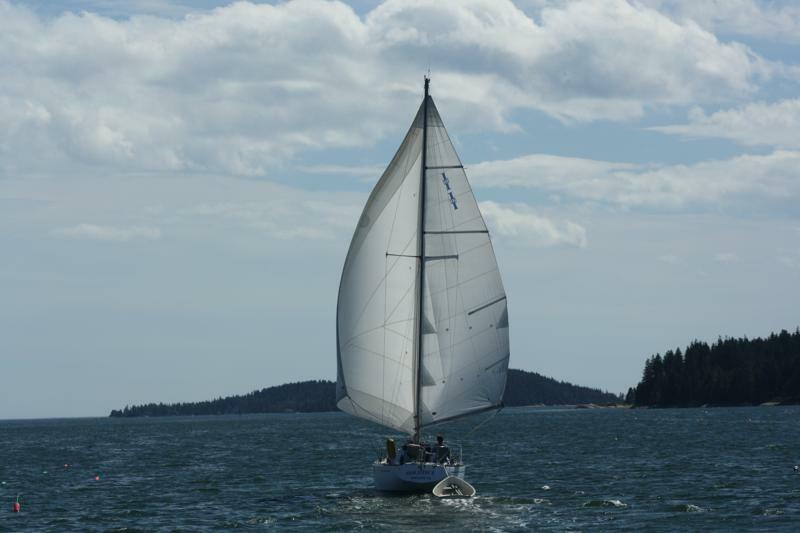 Despite our doubts, the wind held through the narrows and we had a beautiful sail and plenty of room. The scenery continued to be lovely as we sailed along through The Reach. You can see in this screen shot that this was another narrow passage. But we still had plenty of room and a beautiful, scenic sail. Yet again the wind held and we were thrilled to have Solstice’s insider knowledge in the lead. 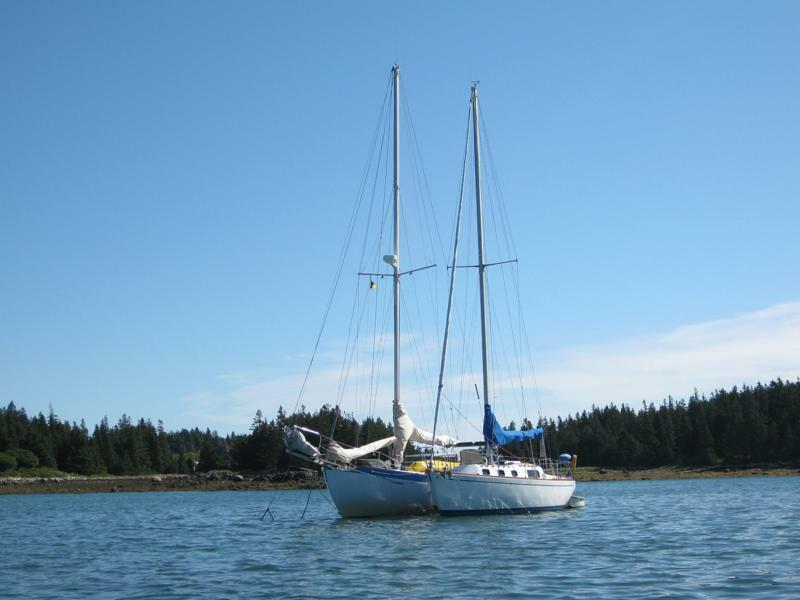 We sailed roughly 20 miles all the way to Isle au Haut. We rafted the boats for the night. Rode Trip was anchored and Solstice was tied alongside as if at a dock. What a superb idea! Now we had double the deck space and had no need to dinghy back and forth. We baked pizzas simultaneously in both ovens, then enjoyed our feast along with gin and tonics aboard Solstice. 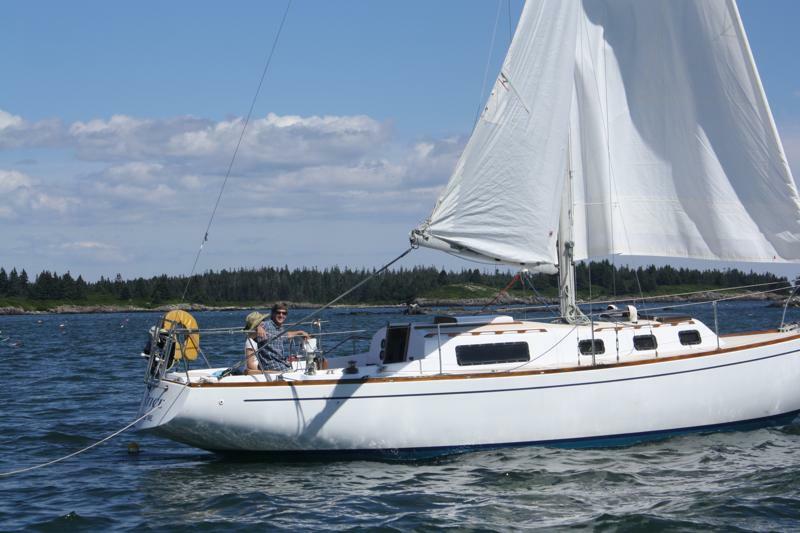 We marveled at the differences between the two 32′ boats; each was just right for its intended purpose, Rode Trip the ocean passage-maker and Solstice the coastal explorer. This entry was posted in Uncategorized and tagged acadia national park, Black Dinah chocolates, chocolatier, isle au haut, Maine by stephanie. Bookmark the permalink. Hi Brian and Stephanie. I’ve been following your blog for a while and enjoy your posts. We live outside Portland and just replaced our Pearson Vanguard of 20 years with a Caliber 38. 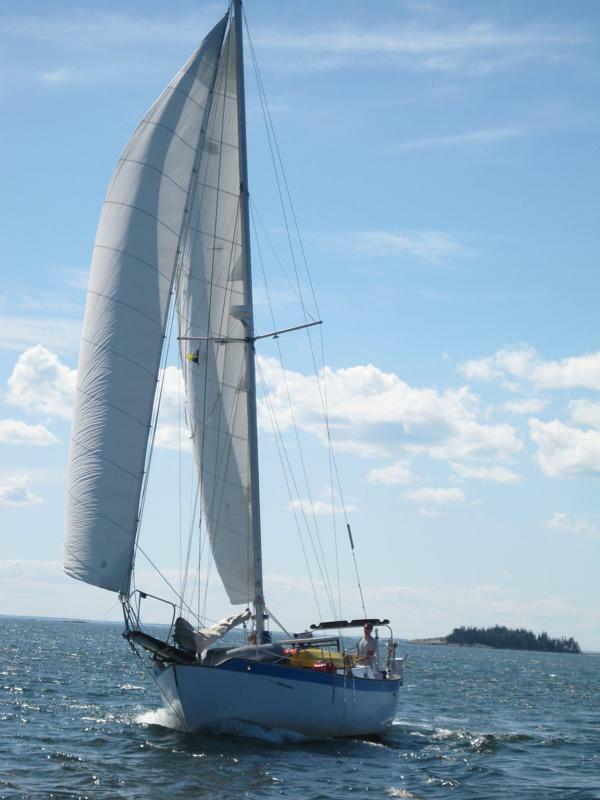 Left Casco Bay last Saturday and just arrived Rockland. Plan to spend another week in the area before heading back. You may be headed south by now but if you are going to be in the Camden Rockland area over the next few days we would like to make you dinner. Thanks Stephanie. We are presently on a mooring at the Landings Marina in Rockland. Had a nice conversation with Brian on the Jennie B that I mistook for a Westsail 32 and he said he met you when you were just here. Small world. We will be hauling our boat in a month or so but maybe going south in a year. Looking forward to following your future travels from my armchair this winter, haha. When do you leave NH and where are you headed? We just met Jennie B – nice couple. We are restocking, Market Basket is by far the cheapest grocery store on the East coast! Hope to start the great migration south by the end of this week, big jumps down, Caribbean bound…the weather will decide our stops along the way.